Imre Kertész, 1929, Year won 2002, "Whenever I start writing, I think of Auschwitz". 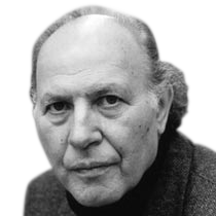 Imre Kertész was born in 1929 – the same year Hitler made Himmler chief of the S.S.; by that year, as many as 100,000 members joined the Nazi party; and in that year, two Jewish authors were born, who shall be the main recorders of one of humanity’s greatest atrocities. One was a brilliant girl called Anna Frank, who perished 16 years later, leaving us a fascinating diary which became a tragic youth biography of an entire nation. The other one was Imre Kertész, who survived the Holocaust and became a world known author. In 2002 he was awarded the Nobel prize in literature. “Whenever I start writing, I think of Auschwitz”, he said. His two well known books “Fatelessness” and “Fiasco” depict the daily cursed routine of prisoners in that hellish place. Paradoxically, it was in Auschwitz that Kertész grasped the profound meaning of concepts such as happiness – “in Auschwitz I have experienced moments of the most extreme happiness, such as a ten minutes break from excruciating indescribable labor; freedom – “survival becomes the greatest freedom”; religion – “hell does not exist. I should know – I have been there”. Kertész, who was not able to set free from Auschwitz’s hell, passed away in 2016.